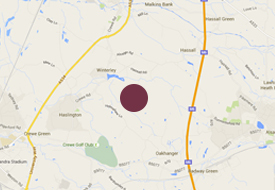 We are a family-run boarding kennels and cattery, set in beautiful Cheshire countryside. Offering luxury accommodation for dogs, cats and other small pets all year round. A&A Animal Hotel was opened in August 1993 by the current owners. We are a medium-sized family-run establishment, dedicated to caring for your pets to the highest possible standard and providing our clients with complete peace of mind. Please browse our website for further information on what we are able to offer you and your pet. We recommend and welcome a visit to see our facilities first-hand and discuss special dietry or other needs. Please ring to make an appointment to view and/or book in. Lots of human contact, attention, cuddles and love. Situated in the heart of beautiful Cheshire countryside. Executive suites for both dogs and cats. Underfloor heating in Executive suites. Each individually thermostat controlled. Dogs individually exercised, mornings and afternoons. Three fully secured exercise areas enabling off lead play. 24 hour “On call” veterinary surgeon.